To do extra work, or not to do extra work… That is the question. If you are new to acting or are simply new in town, I say absolutely. First of all, it isn’t the worst survival actor’s job in the world. * You get PAID to be on set. * You can learn from the cast and crew every time. Most actors don’t start out on huge sets with big budgets, so this can be a good training ground. * There is usually a lot of down time for extras so you can use that time to write letters, read, mail postcards, goal set, etc… Please take advantage of that valuable time. 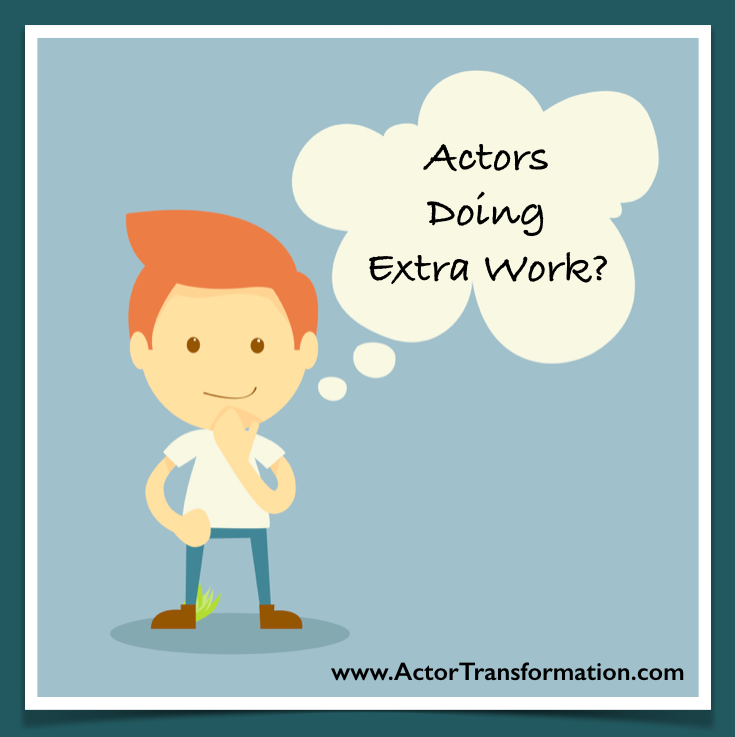 * There are “career extras” and then there are “actors” who happen to be doing a little bit of extra work. Network with the actors and help each other get to the next level. * If you are striving to become SAG eligible, this could help you get your eligibility by earning SAG vouchers if you are lucky. * It is a long shot, but on rare occasions a background extra might even get a line! * Some sets that are exceptionally good learning experiences… Such as sitcom sets. Believe it or not, it can actually be quite competitive. So don’t get wrapped up in the pursuit of extra work instead of acting work. It can be draining and some people think it can be demeaning if you find yourself on a bad set or in a bad situation. Can take you away from auditions, classes, acting work, etc… The real reason you are doing extra work in the first place. But along with everything else in this wacky industry, you can decide to make each situation and opportunity either good or bad. It’s your choice. Get a call sheet on set if you can. It’s always good to know who you are working for. Watch the lead actors, how they hit their marks, their positions to the camera, what they do on set and behind the scenes, etc…. Watch what the members of the crew do in their individual jobs. The more you study, the better you are prepared for when YOU are the lead actor. Network with the other actors who also just happen to be working background work that day. Stay away from any background actors who are negative. This is a biggie. Remember WHY you are doing extra work, that it is just one small step in your actor journey, and always make the most out of each day!